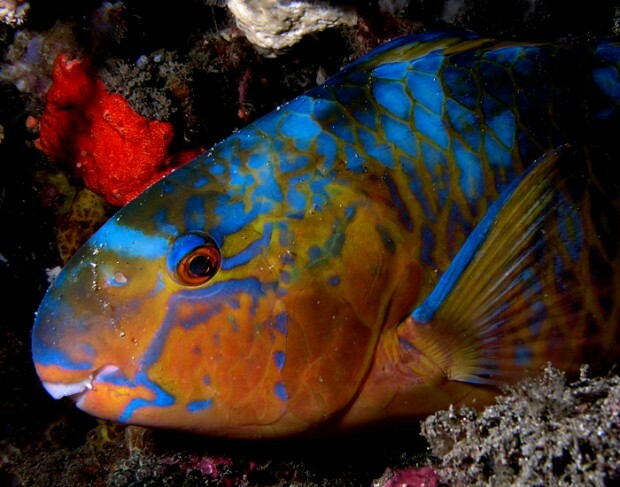 The parrotfish, a species of marine life abundant in Bermuda’s waters, is singlehandedly working to keep both the coral reefs and beaches surrounding the island healthy, all thanks to their voracious appetite and ability to defecate up to 200 pounds of sand per year, with a recent report highlighting the fact that areas that don’t protect the valuable fish are seeing their reefs decline at an alarming rate. According to a National Geographic report, “Parrotfish are colorful and voracious herbivores that spend up to 90 percent of their day eating algae off of coral reefs. And they poop sand [up to 200 pounds of it per year], keeping beaches beachy. According to a report recently released by the Global Coral Reef Monitoring Network of IUCN [PDF here] – a report compiled by 90 experts that analyzed 35,000 surveys conducted at 90 locations around Bermuda and the Caribbean since 1970, says National Geographic – corals in the general region have declined by more than 50 percent since the 1970s; despite this decline, corals surrounding areas with high parrotfish populations, including Bermuda, remain relatively healthy. The report’s release coincides with the recent Reef Watch 2014 event that saw so-called citizen scientists take stock of the health of Bermuda’s coral reefs. “In these areas fishing that harms parrotfish is banned or severely restricted. “Areas, such as Jamaica, the entire Florida Reef Tract from Miami to Key West, and the US Virgin Islands – where parrotfish are not protected – have suffered tragic reef declines.